Nathaniel died before October 22, 1694. 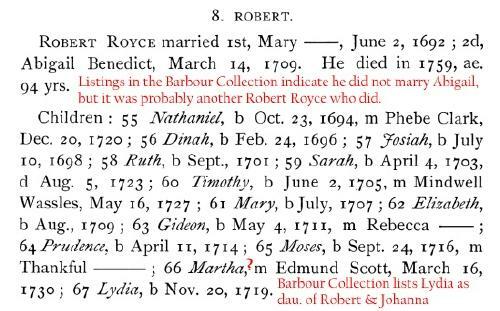 Martha Osborne, Wilcox/Wilcoxson families of New England and their descendants: a genealogical dictionary, Heritage Books, (1993) , Vol. 2, p. 828. "Connecticut Births and Christenings, 1649-1906," database, FamilySearch (https://familysearch.org/ark:/61903/1:1:F748-XLQ : accessed 11 October 2015), Silvanus Willcox, 16 Jul 1771; citing ; FHL microfilm unknown. Lucius B. Barbour, Barbour collection : Connecticut vital records prior to 1850, Salt Lake City: Filmed by the Genealogical Society of Utah, (1949) , Vol. 7, p. 409. Prudence Royce was born perhaps about 1756. Prudence Royce was born perhaps about 1759. C. Bancroft Gillespie, An Historic Record and Pictorial Description of the Town of Meriden, Connecticut, , at https://books.google.com/books?id=-zQWAAAAYAAJ . Meriden, Conn.: Journal Publishing Company, (1906) , p. 406. Charles Henry Stanley Davis, History of Wallingford, Conn., from its settlement in 1670 to the present time, , at https://archive.org/stream/historyofwalling00daviiala . Meriden, Conn.: (1870) , Vol. 1, pp. 763. 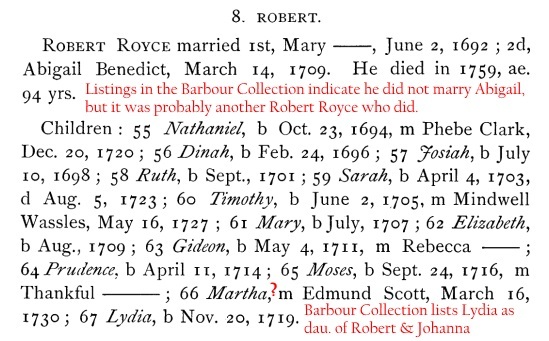 Sally Royce was born perhaps about 1782.